The primary cause of Leamington Spa's segregated social ecosystem is the yuppies. Leamington is sufficiently riddled with enough eateries and drinkeries to keep every nouveau riche family suitably stuffed. For this reason, I ask why, oh why, oh why, did the cumbersome prats of 'The Rose and Crown' in Warwick decide that Leamington Spa required another such a hell hole? A proper spit and sawdust pub. A green king pub so you know what your going to get drink wise. 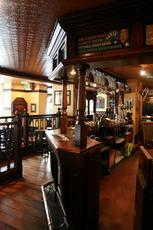 But still has the atmosphere of a really good local pub where all are welcome. Worth it's 7 out of 10 rating but would complan if it was 8. Used to be my favourite pub in Leamington but I feel it has lost its charm and friendliness. The beer is poor, mainly because it is a GK pub but the whole atmosphere has gone down hill. I will not rush back anymore. Really nice pub with 4 ales on although 3 of them were the same old ones, Old Speckled, Abbot & GK IPA. My pint of choice was Olde hill, very well kept. I spent most of Friday night in here and the pub was very busy but the staff were excellent and the only sound was that of conversation. Didn't try the food but the all day breakfast looked good.